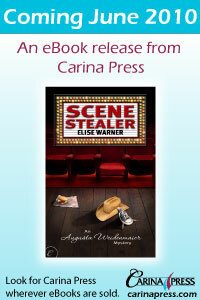 Just received the final cover and banners for Scene Stealer. Looks terrific. Publication by Carina Press will be in June. Excitement reigns. This entry was posted on May 10, 2010 at 3:53 pm and is filed under Uncategorized, writers. You can follow any responses to this entry through the RSS 2.0 feed. You can leave a response, or trackback from your own site. Cool cover, Elise! Love it! !